The DKN A-Frame dumbbell rack is a great addition to any gym and will hold six pairs of rubber hex or chrome dumbbells. 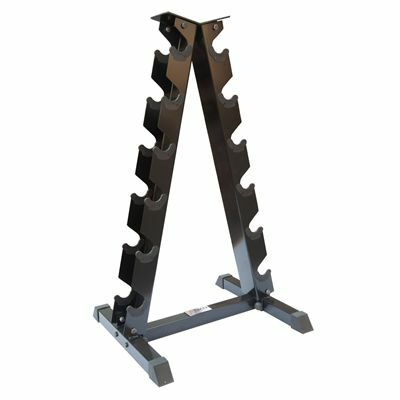 The storage rack is very strong and durable, made from sturdy steel with a secure bolt-together design. The non-slip rubber feet not only keep the weight rack firmly in place but also protects all floors from being scratched. The space-efficient shape of the rack also makes picking up and returning dumbbells much easier, and the nylon-based plastic guards help to stop the rests and dumbbells from being damaged when used. for submitting product information about DKN 6 Pairs A-Frame Dumbbell Rack We aim to answer all questions within 2-3 days. for submitting product information about DKN 6 Pairs A-Frame Dumbbell Rack. We aim to answer all questions within 2-3 days. If you provided your name and email address, we will email you as soon as the answer is published. I purchased rubber hex dumbbells from you, 22.5, 25, 27.5 and 30kg. Would these fit in this rack? Yes, there will be no problem in fitting dumbbells in the rack. The dimensions of the A-frame are 70 x 60 x 115 cm. The dimensions of the carton are 40 x 14 x 117 cm. for submitting product review about DKN 6 Pairs A-Frame Dumbbell Rack.